"The Prince of Soul and the Lighthouse"
This has been the third question on mankind's FAQ list since the dawn of time (numbers one and two being: Is this edible? and Excuse me, would you care to breed?). I know what happens. Believe me, I'd rather not. But I do. There is a lighthouse, and it guides our souls along the narrow path to being reborn as humans. It's the light at the end of the tunnel. Unfortunately, as my undead granddad and the Tibetan special mission monk in my kitchen have kindly told me, there's a problem with the lighthouse. And if the world is to be saved, someone needs to fix it. And really, that's complicated enough as it is. One of the latest and most widely spread trends in the literary world is that of the Northern European crime fiction. It is a praiseworthy trend to a certain degree, but not entirely, because while it opens the doors of the Northern European literature to the world it narrows the opening to a particular genre. That doesn’t mean that a reader should follow this trend to the letter, on the contrary, one should take it as a suggestion for an attempt to discover an entire new literary zone. Following my own advice I went in search of Northern European writers and discovered a Swedish author, Fredrik Brounéus, who crossed the globe to New Zealand to make his debut in English with the science fiction novel, “The Prince of Soul and the Lighthouse”. I say the debut novel in English because before moving to New Zealand in 2009 Fredrik Brounéus published a children’s novel and a young adult one and also a non-fiction children’s book in Swedish. The desire to expand my personal acknowledge of Northern European literature mixed with my love for speculative fiction resulted only naturally in my curiosity about Fredrik Brounéus’ novel, “The Prince of Soul and the Lighthouse”. 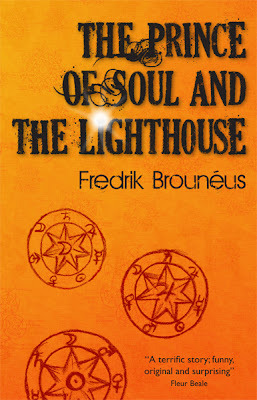 However, I am facing a dilemma when it comes to reviewing “The Prince of Soul and the Lighthouse”, because as much as I pushed myself forward I was not able to finish Fredrik Brounéus’ novel. I managed to reach its halfway point, but unable to continue reading it to its end. I say with all the honesty that I did try to read the novel in full, but for the past year and a half my personal schedule became even tighter and reached a point in which I have to cut things down. It also transformed me in a more impatient reader and if I can’t find enough reasons for reading a book entirely I tend to move from it faster than before. That is the reason for asking myself if it is appropriate for me to write a review, but then again I also need to explain why this particular novel didn’t work for me to its full extent. I said that my patience tends to run thin quickly nowadays, but despite putting that patience to a test “The Prince of Soul and the Lighthouse” did have a few things that sustained the reading until half of the way. Fredrik Brounéus’ novel offered me plenty of hilarious moments through good humor and amusing main character. George Larson leaves the impression of a teenager without fault, has concerns that reminded me in part of my high-school years and offers plenty of witty comments to brighten the reader’s mood. Besides this pleasant character Fredrik Brounéus also creates hilarious situation and dialogues that are a true delight and more than once reaped burst of laughs from my part. Unfortunately, as much as I enjoyed all the humorous elements of the novel they were not enough to sustain the aspects that fell short for “The Prince of Soul and the Lighthouse”. Close after the beginning of the novel it is clear that George Larson is one key element in a world-shattering upcoming event and has a great destiny ahead of him. The question is why? Well, I could not find the answer for this essential question in the first half of the story. As a matter of fact more things concerning George Larson’s destiny are revealed in the novel’s synopsis rather than the actual story. It is also clear from early beginning that another key element is the Lighthouse, but the question that arises again is why. And again more answers can be found in the novel’s synopsis than in the first half of it. These speak of the novel’s pace and rhythm as well, which is a very slow one. Nothing much seems to happen to move the story forward, the characters move from a point to another in a crawling manner and the important details of the plot are kept in the dark just because George Larson has to adapt his mind to the sort of unusual information he has to receive. But that is put at odds by the fact that not even once George Larson questions the abnormal things that are happening to him, the majority of them as unusual as the pieces of information he should receive. Even more disconcerting is the point within the story that shatters the importance of George Larson’s mission to small pieces. If the main character and the lighthouse hold such a massive importance to the world’s existence at the time the story takes place than why George’s failure has no importance because he will get a chance in a next life and another after that and so on? I am not sure how the second half of Fredrik Brounéus’ “The Prince of Soul and the Lighthouse” is, but as much as I was entertained by the novel’s humor the pace and meaningless plot unfolded in the first half made me lose any curiosity I had in the story’s end.